While on an Experiment Station research appointment, John Vincent Atanasoff designed and built the first electronic digital computer. In 1934 he began pursuing the idea of a computing machine that would simplify the tedious process of solving simultaneous equations. 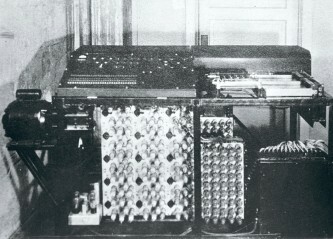 With the help of graduate student Clifford Berry, Atanasoff assembled and demonstrated the first electronic digital computer, the Atanasoff-Berry Computer, from 1939 to 1942. In recognition of his pioneering work, Atanasoff was given the National Medal of Technology in 1990 by President George Bush. The Center for Agricultural and Rural Development was created in the economics department at Iowa State in 1958. Founding director Earl Heady brought quantitative analysis to the study of agricultural policy at CARD, a scientific approach for measuring different policy options. The application of quantitative analytical methods to agriculture was largely what drove the development of CARD’s economic modeling systems. Heady excelled for his use of economic modeling, which allowed agricultural decision-making to become much more scientific. His contributions to research technology during his 25 years as director of CARD included relatively simple models applied to production functions on individual farms as well as massive models incorporating more than 10,000 variables used to assess the impacts of national agricultural policies. The mid-1980s were a time of crisis for American agriculture. As the second director of the Center for Agriculture and Rural Development, Stanley Johnson defined and established four research divisions within the center: trade and agricultural policy, food and nutrition policy, resource and environmental policy and rural and economic development policy. Johnson also incorporated the Food and Agricultural Policy Research Institute, a joint effort with Iowa State and the University of Missouri-Columbia, into CARD. The focus its first year was on providing Congress with quantitative analysis of alternative proposals for the 1985 Farm Bill. Building on Earl Heady’s well-known international work, Stanley Johnson led the Center for Agriculture and Rural Development on research exchanges with many developing countries, most prominently with former Soviet republics. Researchers studied the economic transformation in the former Soviet Union after the collapse of the Iron Curtain. The resource base of the former Soviet Union was measured and U.S. efficiency levels used to predict how trade patterns would evolve. This was done for the economy as a whole and in greater detail for the agriculture sector. Larry Johnson, professor of food science and human nutrition and director of the Center for Crops Utilization Research, discovered a process to simultaneously extract oil and protein from soybeans without using hazardous and polluting solvents such as hexane. A petroleum distillate used to complete the extraction process, hexane has been found to be dangerous to humans and the environment. The extraction process uses a combination of enzymes and water. Johnson is internationally recognized for research and technology development of new value-added products from corn and soybeans. A new green, bio-based method for producing a much-used fuel additive and industrial chemical, that was made from petroleum products, was developed by an Iowa State researcher in 2010. Thomas Bobik, professor of biochemistry, biophysics and molecular biology and Center for Crops Utilization Research affiliate, invented a process for manufacturing isobutene by identifying a new, natural enzyme that produces the fuel organically. Machinery to clean and collect corn cobs for cellulosic ethanol production and other uses was highlighted at the John Deere exhibit at the 2010 Farm Progress Show in Boone. Stuart Birrell, associate professor of agricultural and biosystems engineering and BioCentury Research Farm and Center for Crops Utilization Research affiliate, started development on the system five years earlier. The Iowa State Research Foundation licensed the technology to John Deere, which worked with Hillco Technologies to further develop the technology and bring it to market as the Cob Collection Attachment. Jay-Lin Jane, professor of food science and human nutrition, is a world authority in starch research and its food and industrial applications. She developed a digestion-resistant starch that may aid in the fight against colon cancer and diabetes, and led a team to improve efficiency of ethanol production from raw starch. Jane also has pioneered methods to make molded biorenewable plastics from the proteins in soybeans, corn and chicken feathers. She has 10 patents. Among her many awards are two of the highest international awards given in starch chemistry. The Leopold Center for Sustainable Agriculture was one of several environmentally related centers and programs created by the 1987 Iowa Groundwater Protection Act. This landmark legislation recognized the importance of agriculture to Iowa’s economy, but also regarded the protection of natural resources and improvement of rural economies as essential for Iowa’s future. The new agriculturally focused center was located at Iowa State, establishing and nurturing the university’s first agricultural multidisciplinary research groups. These issue teams included researchers from a variety of academic departments, farmers and extension educators. The center was named after Iowa-born conservationist Aldo Leopold. Dennis Keeney came to Iowa State in 1988 to become the first director of the Leopold Center for Sustainable Agriculture. His vision of the center as a catalyst for work that others might be reluctant to do yielded a host of innovations — multidisciplinary research teams that focused on key Iowa issues, support of basic science to improve soil testing and nutrient management and a broad-based grants program that entertained queries from all quarters. It also brought the Leopold Center an international reputation in research on groundwater quality, nitrogen use and interdisciplinary studies. No matter how hard farmers work, they cannot produce a good crop from bad seeds. Officials in CALS and the United Nations’ Food and Agriculture Organization (FAO) signed an agreement in 2004 to work on seed issues worldwide. The FAO leads international efforts to defeat hunger. Manjit Misra, director of the Iowa State Seed Science Center, said science-based policies and regulations are key to making good seed available at the right time to a farmer anywhere in the world, whether in eastern Iowa or in East Africa. The Biosafety Institute for Genetically Modified Agricultural Products (BIGMAP) is the first institute of its kind in the nation. BIGMAP was established in 2004 as an independent, science-based institute to help provide guidance to the public and policymakers on genetically modified agricultural products. The institute develops tools and methodologies to analyze the risks and benefits of genetically modified plant and animal products and to provide strategies for mitigating the risks to safeguard consumers and the environment. Faculty and staff affiliated with the institute communicate the results of these activities to key policy and regulatory groups, private entities and the public. Animal scientist Steve Ford worked with colleagues at the University of Iowa and USDA to investigate a problem plaguing cattle ranchers in 17 western states in the 1990s. Pregnant cows foraging for food in winter would eat Ponderosa pine needles. Soon after, they gave birth prematurely. Often the calves didn’t survive. Estimates of annual losses ranged from $4.5 to $20 million. Ford found that pine needles caused a dramatic decrease in blood flow to the uterus. The search began for the component in the needles that was to blame. They pinpointed a class of lipids, or fats, as the culprit. The discovery earned the researchers a patent in 1997. The Iowa Pork Industry Center at Iowa State, created in 1994, is at the forefront of swine welfare and pork quality assurance training and assessment. Beginning with the development of the former Swine Welfare Assurance Program and continuing with the Pork Quality Assurance Plus program, ISU faculty and staff members are integral to the ongoing success of these national programs. Iowa State’s James McKean, Ken Stalder and Tom Baas were among the initial group of educators who developed the voluntary SWAP program, complete with certified assessor and producer training programs. These three were joined by Locke Karriker and Anna Johnson as part of the Pork Industry Animal Care Coalition that was responsible for the PQAPlusTM program. An updated and refined meat enhancement technique developed by Iowa State researchers helped an Iowa company boost its sales of Iowa pork. The process, called “deep-basting,” had been used in turkey and other poultry meat. When Iowa State researchers adapted the process for pork, they found it improved pork flavor, juiciness, texture and tenderness. Dennis Olson, director of the Utilization Center for Agricultural Products, said researchers developed the process in cooperation with Iowa Quality Meats, a Des Moines company that processes and markets fresh pork products to hotels, restaurants and other food service enterprises. 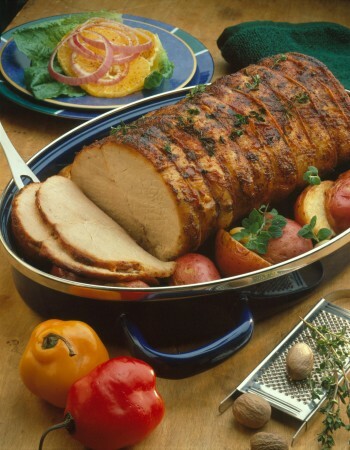 In 1991, the Culinary Chefs of America recognized the company’s deep-basted pork loin as a gold medallion award-winning new product. The Egg Industry Center at Iowa State released a landmark study in October 2013 that shows that while U.S. egg production has increased over the past 50 years, the industry also has been able to significantly decrease its environmental impact. Researchers conducted a lifecycle analysis of U.S. egg production from 1960 to 2010 to evaluate environmental performance measures for the complete lifecycle from crops to hens to the farm gate. Study findings indicate that the environmental efficiencies are the result of a wide range of factors, including the reduction of natural resource use, improved hen feed, better disease control and advancements in hen housing. Hongwei Xin, center director and agricultural and biosystems engineering and animal science professor at Iowa State, was the study’s lead researcher. Although the research program on walleye production at the North Central Regional Aquaculture Center at Iowa State has been diverse — involving pond culture, reproductive biology and larviculture — the goal has always been to develop technology for the production of walleye as a food fish. The Walleye Culture Manual, written by Robert Summerfelt, animal ecologist and Iowa State emeritus professor, was published in 1996 and addresses the aquaculture of walleye. It gives comprehensive coverage of all aspects of reproduction and spawning; brood stock care; collection, transportation and handling of eggs and brood stock; fingerling culture; pond and intensive culture; cage culture; species hybridization; and disease treatment. The Center for Sustainable Rural Livelihoods was created in 2004 to discover and apply science-based and indigenous knowledge to promote resilient, sustainable rural livelihoods in developing countries. A five-year research and development project of the center was successfully concluded in 2012, addressing the low consumption of bean in Uganda’s Kamuli district, despite their nutritional value and productivity. Research determined the influence of preprocessing methods on the digestibility of starch and protein in bean products. Culinary and sensory tests of seven local and 18 improved varieties in Uganda and 16 varieties in Rwanda informed breeders of the best varieties to grow. Seed for two improved varieties were provided to support six farmer groups involved in community-based production and sale of quality seed. 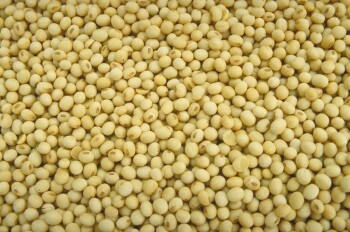 Appealing bean-based products were developed. Farmers were taught how to prepare nutrient-rich meals and shelf-stable products. This led to the development of rural microenterprises to sell snacks.